A stunning view of the inlet property's wetland mosaic, taken by Mary Carkin of Lake City Switchbacks. 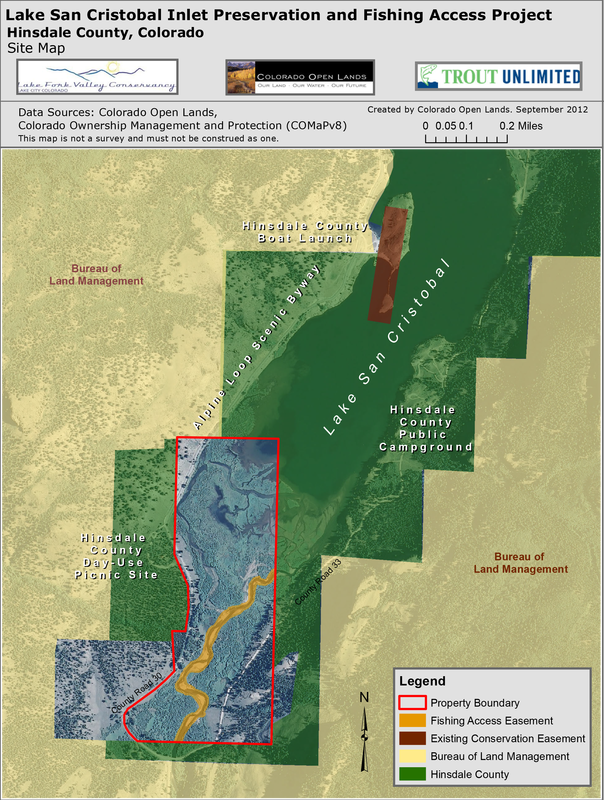 Colorado Open Lands holds the easement, which limits the height and footprint of any structure built on the southern most lot of the peninsula and prevents development on the two remaining lots. The property is Lake San Cristobal's visual centerpiece and a unique ecological haven. A tapestry of historic channels, beaver dams, open water, and wetlands support wildlife ranging from American Bald Eagles to moose. The benefits of preservation extend to boaters, fly fishers, and visitors to Wupperman Campground, as well as those passing through. Motorists sight-seeing along the Alpine Loop Scenic Byway and the Silver Thread Scenic Byway will continue to enjoy vistas preserved by this conservation easement. Because the estate is surrounded by public lands that are protected by special conservation and management status, this initiative preserves the last significant, undeveloped private property within the area. 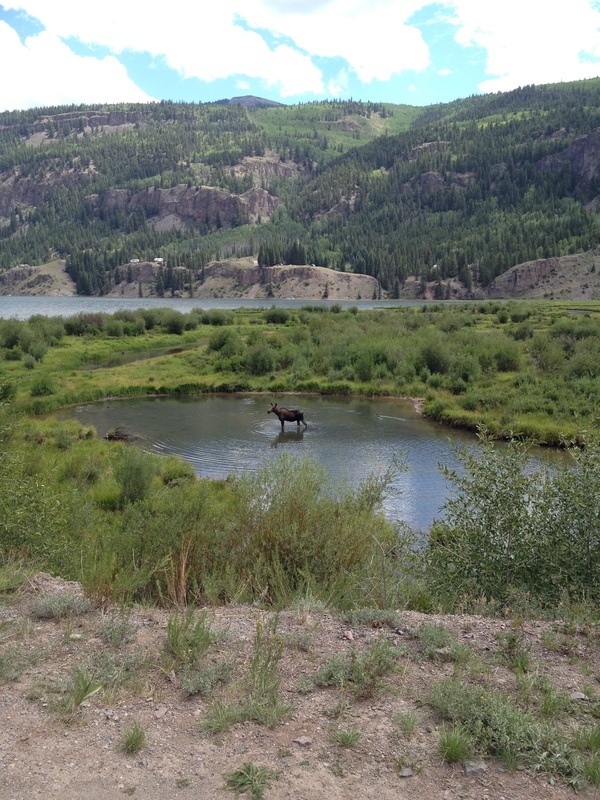 A moose in the delta. 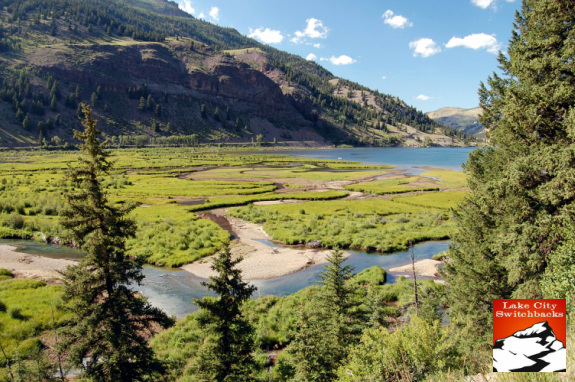 The Project has permanently protected a privately-owned property at the lake’s inlet with a conservation easement, which will be held by the non-profit land trust, Colorado Open Lands. The 156-acre property boasts grasslands and forest rising from the tapestry of wetlands, historic channels, and beaver dams that comprise the inlet’s delta. The delta is a haven not only for many species of wildlife, including Colorado Species of Special Concern the American Bald Eagle, but also for anglers. Fly fishing has historically been allowed on the property through a handshake agreement with the landowner. 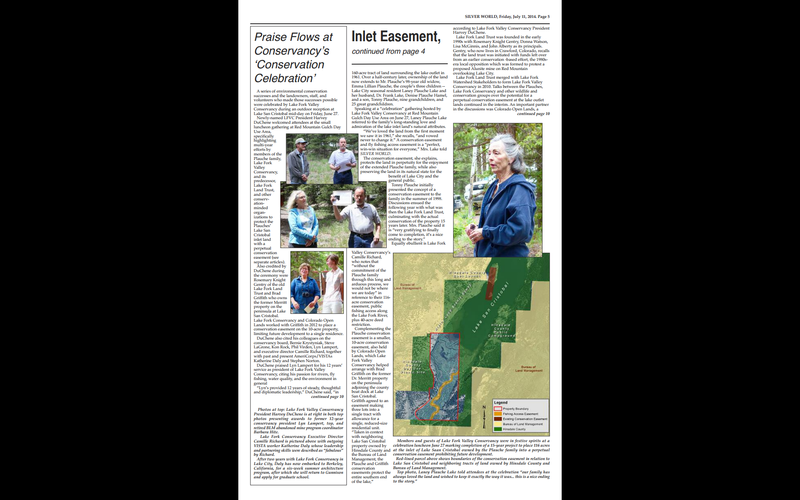 The project partners and the family collaborated with Colorado Parks and Wildlife to formalize permanent public access for fly-fishing along 0.62 miles of the Lake Fork of the Gunnison River that flows through the property. The Colorado Water Conservation Board recommended full funding of the Water Supply Reserve Account grant proposal at their March 19, 2013 meeting in Denver. 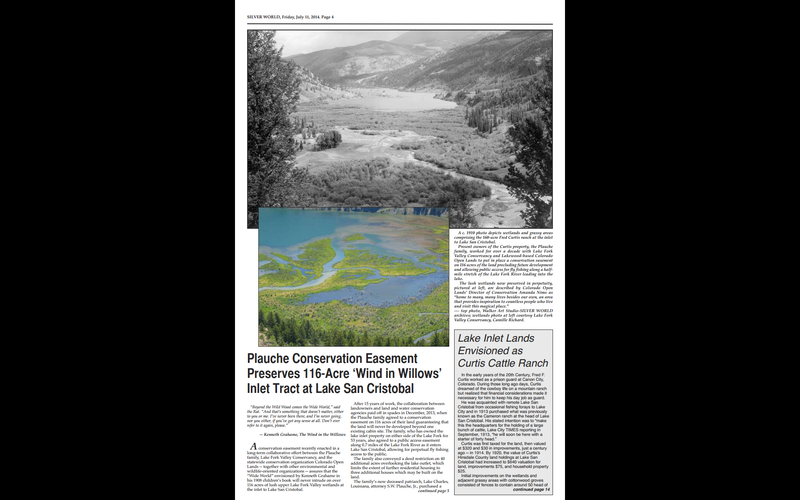 Colorado Open Lands (COL) with partners LFVC and Trout Unlimited (TU) received $167,000 in Water Supply Reserve Account funds for the final funding of the Lake San Cristobal Conservation and Fishing Access Project, known locally as the Plauche Conservation Easement Project. Great Outdoors Colorado and Colorado Parks and Wildlife both made significant grant awards in support of the project in 2012. The CWCB grant allowed us to meet our $1 million target, enabling us to complete the conservation easement by the end of 2013. The Plauche family donated more than $800,000 in land value.